Since then, Dr. Gottlieb’s leadership at FDA has proved that prediction correct. Dr. Gottlieb has been one of the President’s best appointments. Congress has given the National Institutes of Health, NIH, a $9 billion increase from 2015-2019, almost $40 billion dollars in 2019, and FDA plays a key role in bringing new treatments and cures to American patients. In 2016, Congress passed what Leader McConnell called the most important legislation of the Congress, the 21st Century Cures Act, to help speed the development of new drugs and devices. This exciting time in medicine also brings great promise to patients to lower the cost of medicine, as more promising treatments come to market, we see increased competition, which helps to drive down how much patients pay for medicines they need. Dr. Gottlieb’s successful tenure at the agency includes helping to bring more competition to the market. In 2018, FDA approved or tentatively approved over 1,000 generic drugs, approved 34 novel orphan drugs, which are drugs to treat rare diseases, and designated 18 regenerative medicines as regenerative medicine advanced therapies, so they can be reviewed faster. When Dr. Gottlieb took over at FDA, Congress was working to reauthorize the four medical product user fee agreements that make up about a third of FDA’s funding. In addition to reauthorizing the four user fee agreements, Congress worked with Dr. Gottlieb and authorized an expedited approval process for generic drugs where there is little or no market competition, called the Competitive Generic Therapies pathway, as part of the FDA Reauthorization Act of 2017. Since August 2018, FDA has approved five new generic drugs under this pathway and has designated over 140 generic drug applications as qualifying for this pathway. 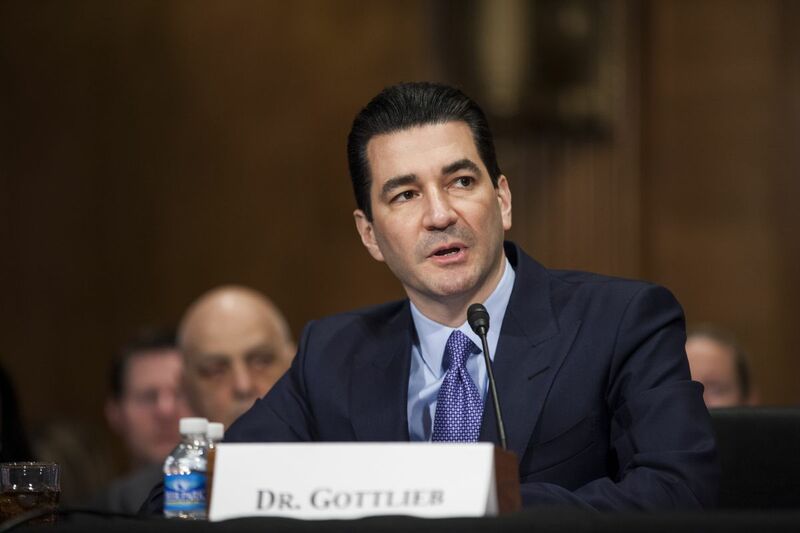 Dr. Gottlieb also announced a new plan, called the Biosimilar Action Plan, to bring generic versions of biologic drugs, called biosimilars, to help improve competition for biologics by increasing market entry of biosimilars and providing more treatment options for patients. FDA has approved a total of 18 biosimilar products since 2010, when the biosimilar pathway was created, 13 of which were approved under Dr. Gottlieb’s watch. Last year, 72 senators worked on legislation to combat the opioid crisis. Dr. Gottlieb provided us with crucial advice as we worked on this legislation and has begun to take advantage of the new law. He has taken steps to help prevent illicit fentanyl, which is 100 times more powerful than heroin, from coming across the border. He worked with Congress to clarify his authority to require opioids to be packaged in blister packs, such as a 3 or 7-day supply, to encourage doctors to prescribe responsibly; and clarified FDA’s authority to require safe disposal options to accompany opioid packaging. Dr. Collins, who leads the NIH, has predicted a nonaddictive opioid in the next decade, which really is the Holy Grail for fighting the opioid crisis and for helping the 50-100 million Americans living with pain. I believe Dr. Gottlieb has laid groundwork to encourage the development of nonaddictive and nonopioid medicines and therapies to treat pain. Dr. Gottlieb was integral to Congress’s ability to reauthorize the animal drug user fees, which authorize the FDA to collect user fees to speed the review and approval of new drugs that farmers, families, and veterinarians rely on to keep their animals healthy and the food supply safe. The 21st Century Cures Act created the Regenerative Medicine Advanced Therapy Designation, which is similar to the very successful breakthrough drug pathway that safely shortened the development and review time for certain drugs, to get them to patients who need them more quickly. While we worked on that law, I heard the story of Nashville resident Doug Oliver. In 2007, Doug began to have trouble seeing and, after a near accident, had his driver’s license taken away and was declared legally blind. The culprit was a rare form of macular degeneration. His doctor at the Vanderbilt Eye Institute told him that while there were no cures, Doug could search online for a clinical trial. Doug found a regenerative medicine clinical trial in Florida, where doctors took cells out of the bone marrow in his hip, spun them in a centrifuge, and then injected those into his eye. Three days later, he began to see. His eyesight eventually improved enough to get his driver’s license back, and he became an effective advocate for more support for regenerative medicine, which we included in the 21st Century Cures Act. So, with his improved vision, he began writing letters and visiting me to advocate for more support for regenerative medicine, which we did in the 21st Century Cures Act. In Cures, we included a pathway to bring new regenerative medicine treatments, similar to the treatment Doug received, to patients more quickly. Dr. Gottlieb has worked to implement that new pathway to help develop safe treatments to ensure more patients are able to take advantage of this cutting-edge, personalized medical technology. Additionally, Dr. Gottlieb has helped the agency develop and advance guidances for gene therapies that will help new innovative companies developing these promising therapies, some of which may be for specific diseases and conditions that provide roadmaps for biotechnology companies who are leading the way in precision medicine. During this exciting time in biomedical research, we are fortunate that Dr. Gottlieb was willing to serve. The FDA and the biomedical community is in better shape today to advance medical innovation and develop the treatments and cures of the future because of his leadership.